Have a hair brush on your lashes with AVRIL Eyelash Curler ! In seconds, it lifts and shapes the lashes for an eye-opening effect. Gentle and easy to use thanks to ergonomic rings, Avril Eye Lash Curler is a must-have tool to prepare your lashes before applying mascara. It comes with an accompanying refill pad, to replace 3 months after use for a optimal eyelash curling. 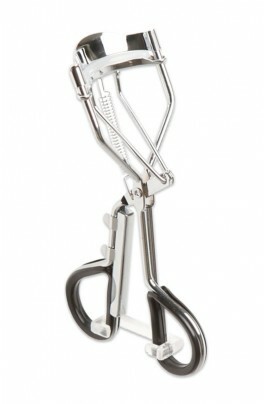 AVRIL EYELASH CURLER IS YOUR ALLY FOR PRETTY EYES ! You have two ways of using Avril Eyelash Curler, and you always want to do it before applying mascara to avoid eyelash breakage. Technique 1 : Carefully position the curler and silicon pad with the lashes between. Gently apply pressure to the lashes and hold in place for 3-5 seconds and repeat process starting from the base and working toward the ends of lashes. Technique 2 : Carefully position curler and silicon pad with the lashes between. Gently apply pressure to the lashes and hold in place for 20 seconds straight. Regularly clean the rubber pad with a clean, dry tissue, and replace it with the accompanying refill pad once the initial is worn down, about every 3 months. Once you’ve used the accompanying refill pad, make sure to replace the curler with a new one. This is important to ensure maximum precision and to avoid any damage to the eyes or lashes. To have access to the refill pad, spin it from the handle of the curler.